Non-profit faith based Mission Projects designed with a clear focus on church planting in rural areas of the world. One of the greatest joys of my life was baptizing new believers in a river near Danli, Honduras, April 2005. One of these baptized believers was Pablo. He had worked for Ann and me for three years in Tegucigalpa on medical-dental-evangelism teams. I had witnessed to him on various occasions, and he listened to the preaching of the gospel many times. We patiently prayed and waited for the Holy Spirit to bring him to a saving knowledge of Jesus Christ. I shared with him the good news in Christ again on our recent trip, and he told me that he was ready to be baptized. Baptism of new believers at Alpha & Omega Baptist Church in Danli, Honduras. Ann has witnessed to his daughter Zoila on many occasions, too. After watching the changes in her father’s life and witnessing his stand for Christ in baptism, she told Ann that she wanted to be baptized on our next trip to Honduras in June. Gabe Churchwell distributed a hundred New Testaments in Spanish to forty students in our seminary extension classes. After the baptism service on Sunday morning, Gable walked along the riverside taking pictures of Honduran women washing clothes in the river. He sensed God leading him to pass out New Testaments to them. One of the women who received one followed Gabe up the hill to where members of the church were and asked some church members to pray with her. They shared Jesus Christ, and she put her faith in Him as her Savior. We had over 40 students in our seminary extension courses, which are attracting well-educated church leaders who are hungry for training in the Bible and Christian education. These are schoolteachers, nurses, and business professionals who are members of Alpha and Omega Baptist Church. In 2003 the Holy Spirit led me to take a team to Zapotillo, about 30 minutes from Danli, where we worked with a school director. On this trip I visited in her home and she and her daughter shared how they came to know Christ as their Savior and their desire to have a Baptist church in their town. “We want a Baptist church that teaches us the same thing you preached when you were here two years ago.” They had already been looking at a piece of property across the street in front of their home and praying that God would provide them a Baptist church. We are praying that God will provide the funds for this new ministry in Zapotillo. To reduce costs for seminary courses, we will not build buildings in Honduras, but operate out of existing churches or church assembly grounds. We have pastors and laymen who are committed to theological education by extension for rural pastors who will coordinate the work and provide logistics in Honduras. We will teach 40-50 classroom hours, provide cost of textbooks, teaching materials, etc. for the students. 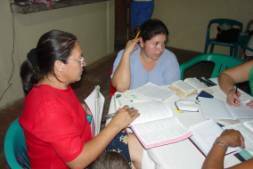 Rural Pastoral Training Ministry in Honduras. Juan Alberto Herrera Ministry Alberto has faithfully served 18 years as a contract worker with mission teams. q We believe it is God’s will for him to serve as a full-time evangelist and pastor. Juan pastors missions in Danli that cooperate with the Honduran Baptist Convention. 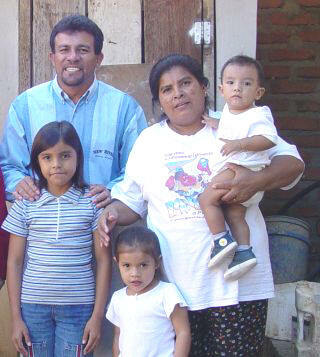 q Juan Alberto Herrera, with his wife Noami and their children, is an evangelist and pastor of Alpha and Omega Baptist Church. He serves as Director for Seminary Extension in Honduras.